Beloved wife of the late Jerome T., Sr.
Loving mother of Jerome T., Jr., Carol (John) Augustiniak, Mary Ann (Dan) Tokarski, and Paul. Cherished grandmother of 11 and great-grandmother of 22. 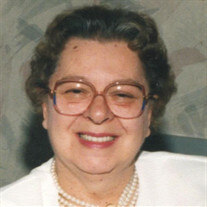 The family of Mrs. Helen T. Jablonski created this Life Tributes page to make it easy to share your memories.